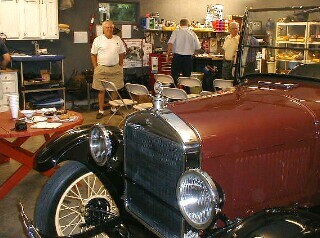 The September meeting was held in Bob Torbet's garage in Lima. There were 7 members present and 1 visitor. Bob introduced Roland Briggs of Lima to the group. He was full of stories about the Model T.
Roland and his brother sat on either side of grandma in the back seat underneath a big quilt. 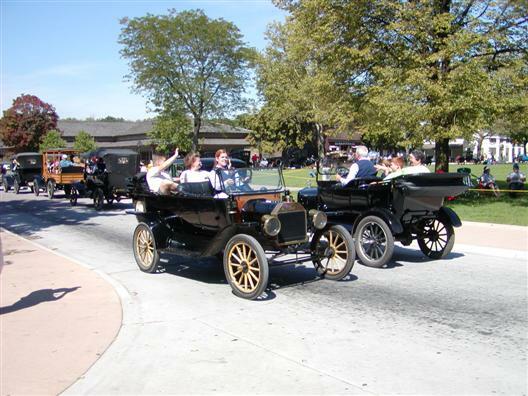 Jim made everyone aware of the upcoming Model T Jamboree and the Old Car Festival at Greenfield Village. Bob told everyone about the picnic at Jack's. It seems that everyone had a good time. food from our cooler, that is the extent of it. 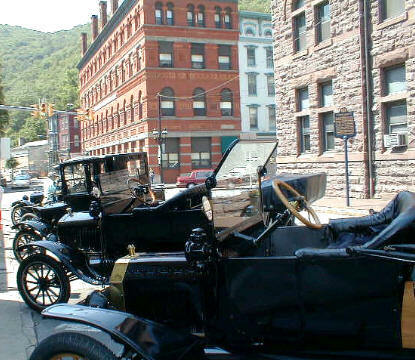 The Old Car Festival is a car show, tour, parade, game, and museum all rapped into one. Above you can see the train ride, autos lined up for a game of some type, and a couple of the high wheel bicycles all at once on the game field. 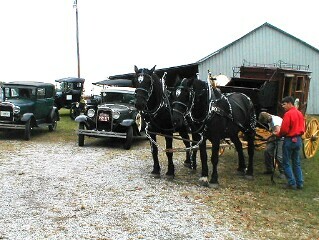 Vintage vehicles at the museum. To the right is my favorite part of the event. 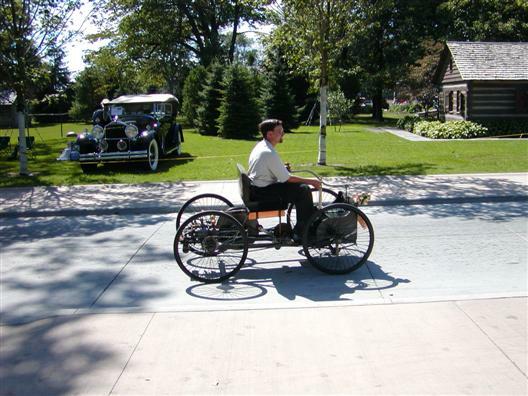 That is driving the cars around the streets of Greenfield Village. The intersections have traffic cops and everyone along the street is smiling and having a good time. Please plan on attending next year's event. It is always the weekend after Labor Day. 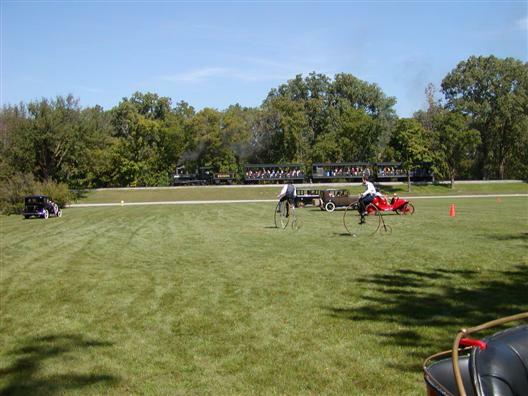 From this picture, you would never guess that this year's All Ohio Model T Jamboree was one of the biggest to date. 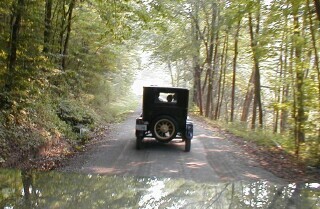 Almost 100 cars attended the 3 day tour of the Hocking Hills region of Southeast Ohio. There was ice cream, hills, old friends, trains, caves, coal mining, brick yards, quaint towns, worn bands, fixin' T's, and a lot of food at the closing banquet. Bob Torbet's garage was the location of September's monthly meeting of the group. It was a chance to see Bob's projects and enjoy his hospitality. Bob has been experimenting with a few things and used this opportunity to show them to the group. The first find was a type of paint or sealer that was as hard as a rock. This stuff couldn't be nicked when hit with a hammer. The second find was some great ice cream. Everyone was stuffed by the time they left for the night. Last weekend We had the opportunity to visit a Buffalo ranch in Southern Ohio. It was great fun to run amonst the buffalo. 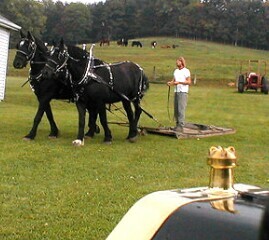 We also took some time out to ride a few horses and hitch up a team to pull the stage coach. still some jewels around. You just need to go to some far off places to find them. From my home is Sycamore, the trip was three hours and ten minutes. In most directions, I can get out of the state in that amount of time.